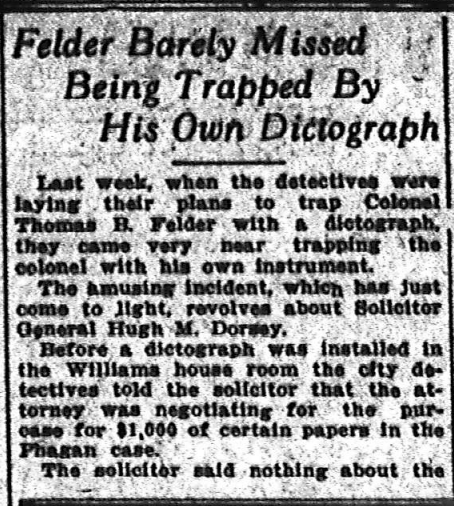 Last week, when the detectives were laying their plans to trap Colonel Thomas B. Felder with a dictograph, they came very near trapping the colonel with his own instrument. The amusing incident, which has just come to light, revolves about Solicitor General Hugh M. Dorsey. Before a dictograph was installed in the Williams house room the city detectives told the solicitor that the attorney was negotiating for the purchase for $1,000 of certain papers in the Phagan case. The solicitor said nothing of the attorney’s confidences. A short time later, however, the detectives came in and asked the solicitor if he could get them a dictograph. Mr. Dorsey says that he thought the officers wanted it for use in some phase of the Phagan case. In fact, he was busy and didn’t even ask why they wanted the delicate little instrument, but immediately thought of Mr. Felder and the Burns people. 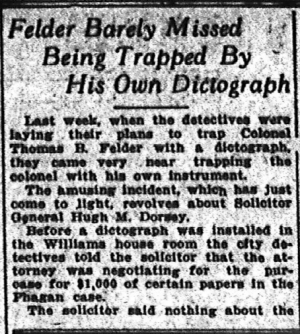 Accordingly he made an effort to secure a dictograph from Mr. Felder, and also from the Burns agent. He failed in this attempt, and thought no more, he says, of the confidence of the detectives and of the attorney until Friday afternoon, when he read The Journal’s big exclusive story of the dictograph record of Colonel Felder’s alleged conversation.